Now that most blogspot blogs have been shifted to the new Blogger, new set of problems are cropping up like the infamous error code "bX-vjhbsj"
There's no real solution but the blogger error disappears after you refresh the webpage a couple of times by pressing the F5 key. You may want to spread the word among your readers else they might skip reading your blog assuming that the blogger server is down which is not the case here. 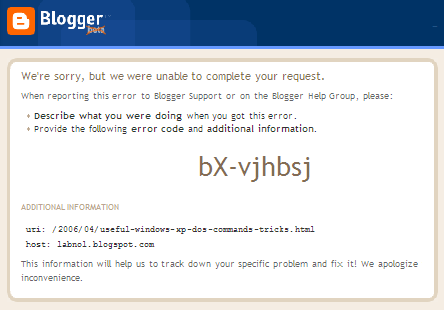 Update from Blogger Support via email: Thanks for reporting this error. We have fixed the problem and you should now find that your blog will display correctly again. If not, please try clearing your browser's cache and cookies, then reloading your blog.